Married Name 4 February 1866 As of 4 February 1866,her married name was Lawrence. Mary Ann Crotchett was born at Golconda North, Pope, Illinois, in 1848. She was the daughter of John Isaac Crotchett and Mary Ann Davidson. Mary Ann Crotchett died in 1891. [S186] Illinois, Illinois Statewide Marriage Index, Vol 00B/ Page 0569. [S249] U.S. Federal Census 1850 U.S. Federal Census, by Ancestry.com, Page 78. Dwelling 611. [S248] U.S. Federal Census 1860 U.S. Federal Census, by Ancestry.com, Pg 12. Stamp 290. Dwelling 88. [S247] U.S. Federal Census 1870 U.S. Federal Census, by Ancestry.com, Page 20. Dwelling 148. [S246] U.S. Federal Census 1880 U.S. Federal Census, by Ancestry.com, NA Film Number T9-0243 Page Number 104C. Thomas Crotchett was born at Golconda North, Pope, Illinois, on 20 March 1833. He was the son of John Isaac Crotchett and Charity Dyer. 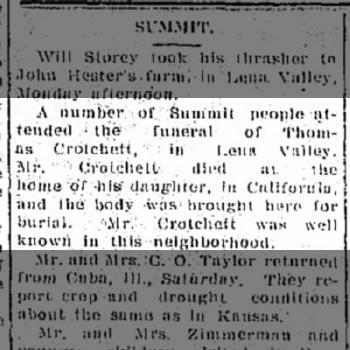 Thomas Crotchett died on 7 April 1913 at Lena Valley, Greenwood, Kansas, at age 80 A number of Summit people attended the funeral of Thomas Crotchett, in Lena Valley. 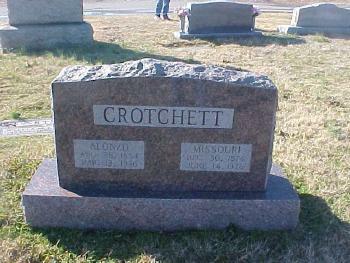 Mr. Crotchett died at the home of his daughter, in California, and the body was brought here for burial. Mr. Crotchett was well known in this neighborhood. 16 Aug 1913 - The Emporia Gazette (Emporia, Kansas). also reported as 11 Apr 1914. He was buried after 7 April 1913 at Lena Valley Cemetery, Lamont, Greenwood, Kansas, headstone states Age: 79 years, 4 months, 17 days (Father), G.A.R. 1 March 1885 Elmerdaro, Lyon, Kansas He appeared on the census of 1 March 1885 at Elmerdaro, Lyon, Kansas. 1 May 1905 Elmerdaro, Lyon, Kansas He appeared on the census of 1 May 1905 at Elmerdaro, Lyon, Kansas, living between Fred Austin and John Felkel. He was MLT INDUCTION on 14 August 1862 at Pope, Illinois; Residence at induction was Pope County, Illinois. Enlisted as a Private on 14 August 1862. Enlisted in Company E, 120th Infantry Regiment Illinois on 29 October 1862. Received a disability discharge Company E, 120th Infantry Regiment Illinois on 19 February 1863.8 On 2 October 1903 Lena Valley - Mr. and Mrs. Crotchett visited Sunday with their daughter, Mrs. George Smith. (article). Circa 1910 Mary Ellen Bell and her grandfather Thomas Crotchett circa 1910. [S244] U.S. Federal Census 1910 U.S. Federal Census, by Ancestry.com, ED43. Stamp 87. Dwelling 192. [S261] Land Office Records Land Patent Record, by Bureau of Land Management, Accession/Serial #: IL1880__.104 BLM Serial #: IL NO S/N. [S251] American Civil War Soldiers unknown record type, by unknown photographer. Name Variation Alonzo Crotchett was also known as A.
Alonzo Crotchett was born at Golconda, Pope, Illinois, on 28 August 1854. 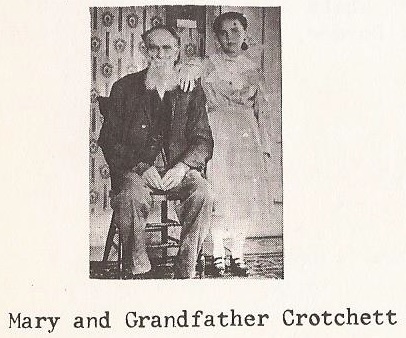 He was the son of Thomas Crotchett and Martha Susan Tanner. Mary Ella Spencer married Alonzo Crotchett, on 8 June 1881. 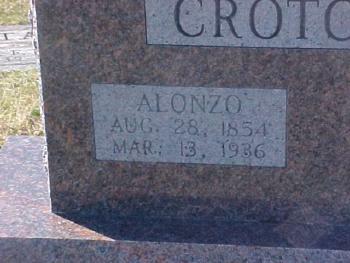 Alonzo Crotchett died on 13 March 1936, at age 81. He was buried after 13 March 1936 at Edgewood Memorial Park, North Little Rock, Pulaski, Arkansas. 1 June 1905 Iola, Allen, Kansas He appeared on the census of 1 June 1905 at Iola, Allen, Kansas. Morrilton, Genealogy Crotchett --- Tanner, pg 73. Also in the Arkansas Marriage certificate Book K. Page 152. [S246] U.S. Federal Census 1880 U.S. Federal Census, by Ancestry.com, NA Film Number T9-0376. Page 615C. [S245] U.S. Federal Census 1900 U.S. Federal Census, by Ancestry.com, ED38. Dwelling 58. [S244] U.S. Federal Census 1910 U.S. Federal Census, by Ancestry.com, ED106. Dwelling 338. [S243] U.S. Federal Census 1920 U.S. Federal Census, by Ancestry.com, Sheet 16B. ED166. Ward 4. Dwelling 316. Rhoda Ann Crotchett was born at Golconda, Pope, Illinois, on 6 November 1855. She was the daughter of Thomas Crotchett and Martha Susan Tanner. Rhoda Ann Crotchett died on 28 September 1856. Melissa Ellen Crotchett was born at Golconda, Pope, Illinois, on 7 July 1858. Melissa Ellen Crotchett died on 23 August 1859, at age 1. Name Variation Mary Elizabeth Crotchett was also known as M. E.
Nickname Mary Elizabeth Crotchett also went by the name of Bettie. Married Name 12 October 1881 As of 12 October 1881,her married name was Smith. Mary Elizabeth Crotchett was born at Golconda, Pope, Illinois, on 1 January 1860. Mary Elizabeth Crotchett married James Edward Smith, son of George Washington Smith and Sarah Shoemaker, on 12 October 1881 at in Bettie's home, County Line Farm, Lyon, Kansas. 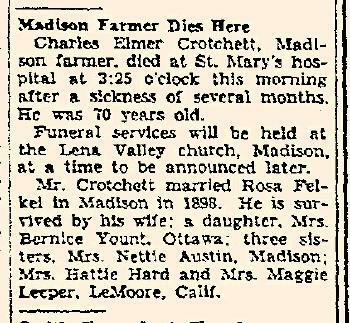 Mary Elizabeth Crotchett died on 22 April 1929 at Farm, Lena Valley, Lyon, Kansas, at age 69. She was buried after 22 April 1929 at Lena Valley Cemetery, Lamont, Greenwood, Kansas. 1915 Elmerdaro, Lyon, Kansas Mary Elizabeth Crotchett appeared on the census of 1915 in the household of James Edward Smith at Elmerdaro, Lyon, Kansas. Mary Elizabeth Crotchett had 4 with 3 living in 1900 children. [S245] U.S. Federal Census 1900 U.S. Federal Census, by Ancestry.com, ED67. Dwelling 242. Name Variation Harriet Jane Crotchett was also known as Hattie J. Married Name 28 April 1912 As of 28 April 1912,her married name was Hard. Harriet Jane Crotchett married George Riley Smith, son of George Washington Smith and Sarah Shoemaker, on 12 October 1881 at Louisburg, Miami, Kansas. Harriet Jane Crotchett married William H. Hard on 28 April 1912 at Lemoore, Kings, California. 1 March 1895 Shell Rock, Greenwood, Kansas Harriet Jane Crotchett appeared on the census of 1 March 1895 in the household of George Riley Smith at Shell Rock, Greenwood, Kansas. Harriet Jane Crotchett had zero children. She obtained US Social Security Card; according to the California Death Index. She lived on 28 September 1903 at Lena Valley, Kansas. 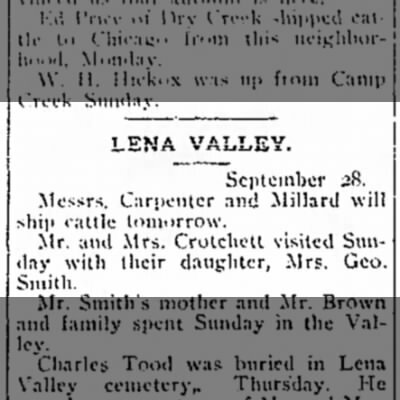 On 2 October 1903 Lena Valley - Mr. and Mrs. Crotchett visited Sunday with their daughter, Mrs. George Smith. (article). [S243] U.S. Federal Census 1920 U.S. Federal Census, by Ancestry.com, ED127. Sheet 3A. Dwelling 60. [S250] U.S. Federal Census 1930 U.S. Federal Census, by Ancestry.com, ED16-7. Dwelling 306. Name Variation Emeline Charlotte Crotchett was also known as Eva C.
Name Variation Emeline Charlotte Crotchett was also known as Lo. Name Variation Emeline Charlotte Crotchett was also known as Emma. Married Name 3 February 1882 As of 3 February 1882,her married name was Bell. Emeline Charlotte Crotchett was born at Golconda, Pope, Illinois, on 8 March 1863. Emeline Charlotte Crotchett married John Willis Bell on 3 February 1882 at Paola, Miami, Kansas. Emeline Charlotte Crotchett died on 20 November 1931, at age 68. She was buried after 20 November 1931 at Blankinship Cemetery, Butler, Kansas. [S243] U.S. Federal Census 1920 U.S. Federal Census, by Ancestry.com, ED9. Dwelling 67. [S250] U.S. Federal Census 1930 U.S. Federal Census, by Ancestry.com, ED8-10. Dwelling 19. Name Variation Martha Loretta Crotchett was also known as Retta. Name Variation Martha Loretta Crotchett was also known as Loretta. Married Name 30 May 1881 As of 30 May 1881,her married name was Smith. Martha Loretta Crotchett was born at Golconda, Pope, Illinois, on 28 September 1864. 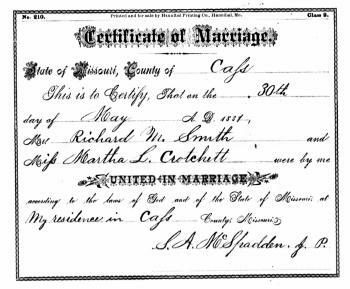 Martha Loretta Crotchett married Richard Morris Smith, son of George Washington Smith and Sarah Shoemaker, on 30 May 1881 at Cass, Missouri, also reported as Lyon county, Kansas. 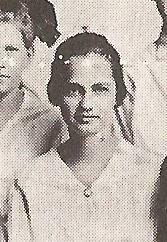 Martha Loretta Crotchett died on 7 February 1944 at Burlington, Coffey, Kansas, at age 79 also reported as Oklahoma. She was buried after 7 February 1944 at High Point Cemetery, Buffalo, Harper, Oklahoma. Martha Loretta Crotchett had 3 with 3 living in 1900 children. [S245] U.S. Federal Census 1900 U.S. Federal Census, by Ancestry.com, ED43. Dwelling 104. [S244] U.S. Federal Census 1910 U.S. Federal Census, by Ancestry.com, Year: 1910; Census Place: Haskell, Harper, Oklahoma; Roll: T624_1249; Page: 14A; Enumeration District: 0166; FHL microfilm: 1375262. [S243] U.S. Federal Census 1920 U.S. Federal Census, by Ancestry.com, ED115. Sheet 2B. Dwelling 38. [S250] U.S. Federal Census 1930 U.S. Federal Census, by Ancestry.com, ED30-14. Dwelling 4. Eliza Alice Crotchett was born on 4 January 1867 at Jackson, Missouri. Eliza Alice Crotchett died on 16 August 1869, at age 2. Name Variation Delilah Amos Crotchett was also known as D. A. Name Variation Delilah Amos Crotchett was also known as Lila. Married Name 22 November 1891 As of 22 November 1891,her married name was Leeper. Delilah Amos Crotchett was born on 13 May 1868 at Jackson, Missouri, also reported as 13 May 1869. 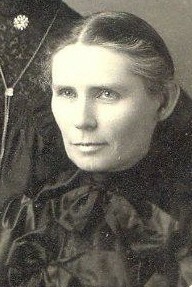 Delilah Amos Crotchett married Harvey Ellwood Leeper, son of Peter Leeper and Margaret A. Borroff, on 22 November 1891 at Lena Valley, Lyon, Kansas. Delilah Amos Crotchett died on 24 February 1952 at Benton, Oregon, at age 83 Delilah C. Leeper, a resident of Corvallis and vicinity for the past 45 years died at her home, 425 South Fourth, Sunday afternoon, following a long illness. 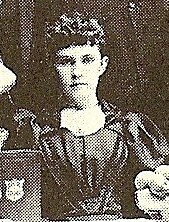 The daughter of Thomas and Martha Tanner Leeper she was born at Pleasant Hill, Missouri, on May 13, 1868. When a small girl she moved with her parents to Madison, Kansas. On November 22, 1891 she was married to Harvey E. Leeper at Madison. The couple made their home near Garden Plains, Kansas until 1898 when they came to Oregon, locating at Hardman. In 1907 they came to Corvallis. Mr. Leeper passed away on July 21, 1932. 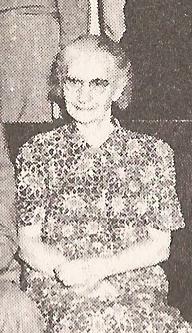 Mrs. Leeper was a member of the Methodist church of Corvallis. She is survived by one daughter, Mrs. Enid Smith, Grayland, Wash; one sister, Mrs. W. H. Hard, Lemoore, Calif; two grandchildren and two great grandchildren. Funeral services will be held at the Warner-McHenry funeral home Wednesday at 1:30 p.m. with Rev. Daniel D.Walker officiating. Interment will be in the Crystal Lake (Masonic) cemetery. She was buried after 24 February 1952 at Crystal Lake Cemetery, Corvallis, Benton, Oregon. 1 March 1885 Elmerdaro, Lyon, Kansas Delilah Amos Crotchett appeared on the census of 1 March 1885 in the household of Thomas Crotchett at Elmerdaro, Lyon, Kansas. Morrilton, Genealogy Crotchett --- Tanner, Pg 100. [S245] U.S. Federal Census 1900 U.S. Federal Census, by Ancestry.com, ED31. Dwelling 82. [S250] U.S. Federal Census 1930 U.S. Federal Census, by Ancestry.com, ED2-30. Dwelling 29. Thomas Edward Crotchett was born on 26 September 1871 at Jackson, Missouri. Thomas Edward Crotchett died on 13 February 1872. Name Variation Margaret Mable Crotchett was also known as Maggie. Married Name 8 May 1892 As of 8 May 1892,her married name was Leeper. Margaret Mable Crotchett was born on 10 March 1873 at Jackson, Missouri, also reported as Mar 1874. William S. Leeper married Margaret Mable Crotchett at Lena Valley, Lyon, Kansas, on 8 May 1892. She was buried after 25 August 1948 at Lemoore Cemetery, Lemoore, Kings, California. 1 March 1885 Elmerdaro, Lyon, Kansas Margaret Mable Crotchett appeared on the census of 1 March 1885 in the household of Thomas Crotchett at Elmerdaro, Lyon, Kansas. Margaret Mable Crotchett had 1 with 1 living in 1900 children. 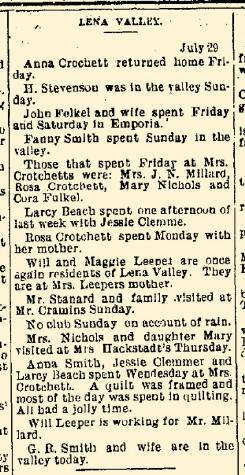 In July 1902 at Lena Valley, Lyon, Kansas, Happenings in Lena Valley including Will and Maggie Leeper living with her mother Martha (Tanner) Crotchett. She had 6 with 6 living in Apr 1910 children. [S245] U.S. Federal Census 1900 U.S. Federal Census, by Ancestry.com, ED87. Dwelling 48. [S243] U.S. Federal Census 1920 U.S. Federal Census, by Ancestry.com, ED125. Dwelling 116. Name Variation Charles Elmer Crotchett was also known as C. E.
Name Variation Charles Elmer Crotchett was also known as Charley. 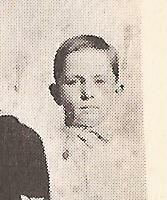 Charles Elmer Crotchett was born at Cass, Missouri, on 16 June 1875. Charles Elmer Crotchett died on 5 January 1946 at Greenwood, Kansas, at age 70 also reported as 5 Jan 1948; Charles Elmer Crotchett obituary. He was buried after 5 January 1946 at Lena Valley Cemetery, Greenwood, Kansas. 1 March 1885 Elmerdaro, Lyon, Kansas Charles Elmer Crotchett appeared on the census of 1 March 1885 in the household of Thomas Crotchett at Elmerdaro, Lyon, Kansas. 1915 Shell Rock, Greenwood, Kansas He appeared on the census of 1915 at Shell Rock, Greenwood, Kansas, living next to Fred Austin. Morrilton, Genealogy Crotchett --- Tanner, Pg 105. 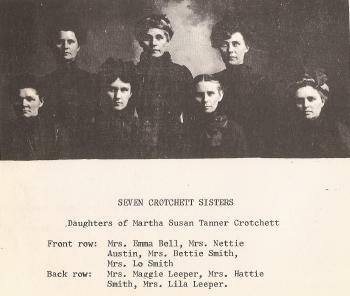 Nickname Jannette Allen Crotchett also went by the name of Nettie. Name Variation Jannette Allen Crotchett was also known as Jeanette Allen. Married Name 22 February 1903 As of 22 February 1903,her married name was Austin. Jannette Allen Crotchett was born on 30 October 1879 at Miami, Kansas. 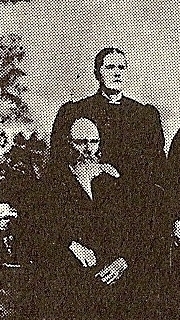 Frederick Clarence Austin married Jannette Allen Crotchett at Methodist Parsonage, Madison, Greenwood, Kansas, on 22 February 1903; by Rev Robert M. Cullison. She died on 11 October 1961 at Greenwood, Kansas, at age 81 also reported as 1946. She was buried after 11 October 1961 at Lena Valley Cemetery, Greenwood, Kansas. 1 March 1885 Elmerdaro, Lyon, Kansas Jannette Allen Crotchett appeared on the census of 1 March 1885 in the household of Thomas Crotchett at Elmerdaro, Lyon, Kansas. 1 May 1905 Elmerdaro, Lyon, Kansas Jannette Allen Crotchett appeared on the census of 1 May 1905 in the household of Frederick Clarence Austin at Elmerdaro, Lyon, Kansas; living next door to Thomas Crotchett. 1915 Shell Rock, Greenwood, Kansas Jannette Allen Crotchett appeared on the census of 1915 in the household of Frederick Clarence Austin at Shell Rock, Greenwood, Kansas; living next to Charley Crotchett. Jannette Allen Crotchett had 3 with 3 living in 1910 children. [S244] U.S. Federal Census 1910 U.S. Federal Census, by Ancestry.com, ED28. Dwelling 66. [S243] U.S. Federal Census 1920 U.S. Federal Census, by Ancestry.com, ED24. Sheet 9B. [S250] U.S. Federal Census 1930 U.S. Federal Census, by Ancestry.com, ED9. Dwelling 106. Name Variation Mary Ella Spencer was also known as Ellen. 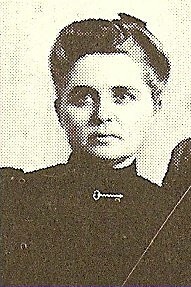 Mary Ella Spencer was born in 1860. Mary Ella Spencer died on 19 March 1894. She was buried after 19 March 1894 at Oronogo Cemetery, Oronogo, Jasper, Missouri. Name Variation James Edward Smith was also known as J. E.
James Edward Smith was born on 28 June 1859 at Pulaski, Illinois. James Edward Smith married Mary Elizabeth Crotchett, daughter of Thomas Crotchett and Martha Susan Tanner, on 12 October 1881 at in Bettie's home, County Line Farm, Lyon, Kansas. James Edward Smith died on 30 March 1916 at Farm, Lena Valley, Lyon, Kansas, at age 56. He was buried after 30 March 1916 at Lena Valley Cemetery, Lamont, Greenwood, Kansas. 1915 Elmerdaro, Lyon, Kansas He appeared on the census of 1915 at Elmerdaro, Lyon, Kansas. Name Variation William S. Leeper was also known as Will. 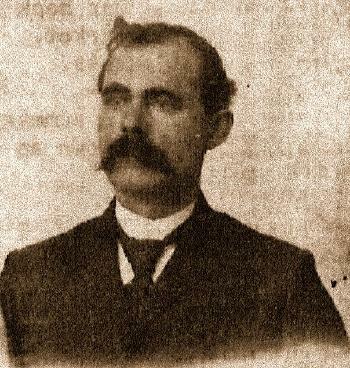 William S. Leeper was born on 23 September 1864 at Ohio. He was the son of Peter Leeper and Margaret A. Borroff. William S. Leeper died on 19 October 1947 at San Joaquin, California, at age 83. He was buried after 19 October 1947 at Lemoore Cemetery, Lemoore, Kings, California. 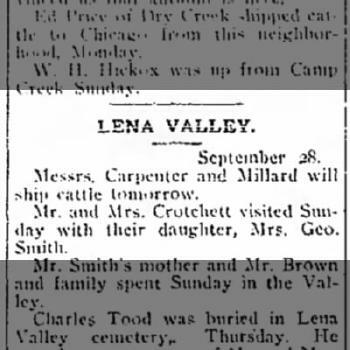 In July 1902 at Lena Valley, Lyon, Kansas, Happenings in Lena Valley including Will and Maggie Leeper living with her mother Martha (Tanner) Crotchett. [S247] U.S. Federal Census 1870 U.S. Federal Census, by Ancestry.com, Page 12. Dwelling 86. [S246] U.S. Federal Census 1880 U.S. Federal Census, by Ancestry.com, NA Film Number T9-0677 Page Number 336C. Name Variation Frederick Clarence Austin was also known as Fred C.
Name Variation Frederick Clarence Austin was also known as F. C.
Frederick Clarence Austin was born on 23 February 1876 at Missouri. He was the son of Jefferson Crawford Austin and Catherine Childress. Frederick Clarence Austin died on 23 January 1963 at age 86. He was buried after 23 January 1963 at Lena Valley Cemetery, Greenwood, Kansas. 1 May 1905 Elmerdaro, Lyon, Kansas Frederick Clarence Austin appeared on the census of 1 May 1905 at Elmerdaro, Lyon, Kansas, living next door to Thomas Crotchett. 1915 Shell Rock, Greenwood, Kansas He appeared on the census of 1915 at Shell Rock, Greenwood, Kansas, living next to Charley Crotchett. [S246] U.S. Federal Census 1880 U.S. Federal Census, by Ancestry.com, NA Film Number T9-0387. Page 339B. ED114. Dwelling 125. Name Variation Annilee Crotchett was also known as Amelia. Name Variation Annilee Crotchett was also known as Anna Lee. Married Name 3 June 1908 As of 3 June 1908,her married name was Allen. Married Name 14 May 1939 As of 14 May 1939,her married name was Starliper. Annilee Crotchett was born at Columbus, Cherokee, Kansas, on 19 June 1883. She was the daughter of Alonzo Crotchett and Mary Ella Spencer. Annilee Crotchett married George Arthur Allen, son of Evennus Allen and Mary Macline, on 3 June 1908 at at the home of her grandfather, Thomas Crotchett, near Madison, Greenwood, Kansas, by Rev. W. M. Stanahan. also reported as 03 Jun 1912. 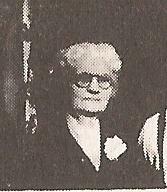 Annilee Crotchett married Judge William Alva Starliper on 14 May 1939 at Burlington, Kansas. Annilee Crotchett died on 3 October 1976 at age 93 also reported as 30 Oct 1976. She was buried after 3 October 1976 at Graceland Cemetery, Burlington, Coffey, Kansas. Name Variation Mabelle Edith Crotchett was also known as Mabelle A. Name Variation Mabelle Edith Crotchett was also known as Mabel. Married Name 12 April 1911 As of 12 April 1911,her married name was Abrams. Married Name 23 May 1940 As of 23 May 1940,her married name was Cornwall. Mabelle Edith Crotchett was born on 15 December 1887 at Joplin, Jasper, Missouri, also reported as Orongo, Jasper county, Missouri. Mabelle Edith Crotchett married Herman Marion Abrams on 12 April 1911 at Panama while Mabelle was a Government nurse. Mabelle Edith Crotchett married George A. Cornwall on 23 May 1940. Mabelle Edith Crotchett died on 8 September 1963 at San Francisco, California, at age 75 also reported as 07 Aug 1965. She was buried after 8 September 1963 at Cypress Lawn Memorial Park, Colma, San Mateo, California. Mabelle Edith Crotchett migrated on 20 April 1911 at New Orleans, Louisiana, Name: Mabelle E Abrams Arrival Date: 20 Apr 1911 Age: 23 Gender: Female Port of Departure: Colon, Panama Ship Name: Cartago Port of Arrival: New Orleans, Louisiana Birthplace: Missouri,Joplin. She lived in 1952 at San Francisco, California. Name Variation Harry Crochett was also known as Crotchett. Harry Crochett was born at Leroy, Coffey, Kansas, on 10 February 1898. He was the son of Alonzo Crotchett and Missouri Johnsten. Harry Crochett married Addie Thomas on 4 August 1917 at Little Rock, Arkansas. 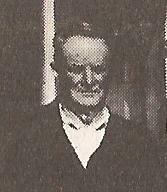 Harry Crochett died on 16 July 1922 at age 24 also reported as 18 Jul 1922. He was buried after 16 July 1922 at Bethel Methodist Church Cemetery, Jacksonville, Pulaski, Arkansas, also reported as 18 Jul 1922; United States Navy - WW I. 1 June 1905 Iola, Allen, Kansas Harry Crochett appeared on the census of 1 June 1905 in the household of Alonzo Crotchett at Iola, Allen, Kansas. [S243] U.S. Federal Census 1920 U.S. Federal Census, by Ancestry.com, Dwelling 1. ED15. Sheet 1B. Name Variation Loleta Faye Crotchett was also known as Faye. Name Variation Loleta Faye Crotchett was also known as Fay. Married Name 12 June 1919 As of 12 June 1919,her married name was Jones. Loleta Faye Crotchett was born at Leroy, Coffey, Kansas, on 19 April 1900. Loleta Faye Crotchett married Reverand George Elliott Jones on 12 June 1919 at Argenta (now North Little Rock), Pulaski, Arkansas. Loleta Faye Crotchett died on 25 July 1999 at age 99. She was buried after 25 July 1999 at Elmwood Cemetery, Morrilton, Conway, Arkansas. 1 June 1905 Iola, Allen, Kansas Loleta Faye Crotchett appeared on the census of 1 June 1905 in the household of Alonzo Crotchett at Iola, Allen, Kansas. Loleta Faye Crotchett obtained US Social Security Card at Missouri; last residence Cave Springs, Benton, Arkansas. Name Variation Earle Crotchett was also known as Earl. Earle Crotchett was born at Iola, Allen, Kansas, on 18 July 1902. Earle Crotchett married Ruby Stiyrne circa 1922 at North Little Rock, Arkansas. Earle Crotchett married Eunice E. Fuller on 28 July 1934 at Garland, Arkansas. Earle Crotchett married Evelyn Jean Anderson circa 1942. Earle Crotchett and Evelyn Jean Anderson were divorced circa 1948. Earle Crotchett died on 30 March 1971 at Chicago, Cook, Illinois, at age 68 Earle Crotchett obituary. He was buried after 30 March 1971 at Rosehill Cemetery and Mausoleum, Chicago, Cook, Illinois. 1 June 1905 Iola, Allen, Kansas Earle Crotchett appeared on the census of 1 June 1905 in the household of Alonzo Crotchett at Iola, Allen, Kansas. Earle Crotchett obtained US Social Security Card at Tennessee; Last residence Chicago, Cook, Illinois. He and Ruby Stiyrne lived between 1926 and 1931 at Little Rock, Pulaski, Arkansas. 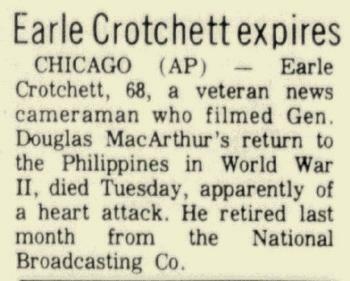 Earle Crotchett was a newsreel cameraman with Universal Newsreels in 1940. [S373] U.S. Federal Census 1940 U.S. Federal Census, by Ancestry.com, Year: 1940; Census Place: Memphis, Shelby, Tennessee; Roll: T627_3966; Page: 1B; Enumeration District: 98-193. 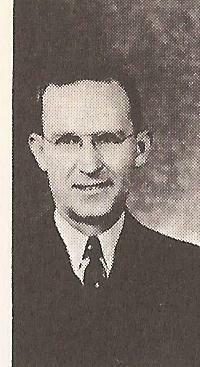 Dale R. Crotchett was born at Iola, Allen, Kansas, on 30 June 1904. 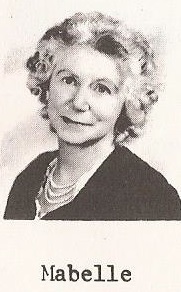 Dale R. Crotchett married Alta Faye Tilley, daughter of W. L. Tilley and Lillie M. (? ), on 18 May 1929 at North Little Rock, Pulaski, Arkansas. 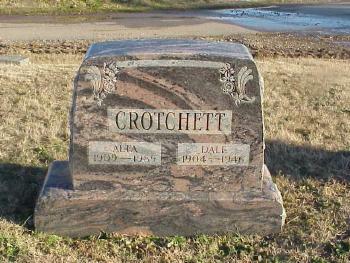 Dale R. Crotchett died on 31 December 1946, at age 42. He was buried in January 1947 at Edgewood Cemetery, Pulaski, Arkansas. 1 June 1905 Iola, Allen, Kansas Dale R. Crotchett appeared on the census of 1 June 1905 in the household of Alonzo Crotchett at Iola, Allen, Kansas. [S250] U.S. Federal Census 1930 U.S. Federal Census, by Ancestry.com, ED42-8. Dwelling 162-220. Nickname Hattie Juanita Crotchett also went by the name of Juanita. Married Name 17 June 1925 As of 17 June 1925,her married name was Durham. 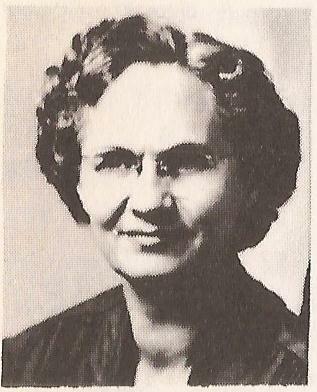 Hattie Juanita Crotchett was born at Iola, Allen, Kansas, on 27 August 1906. Hattie Juanita Crotchett married Barney Harris Durham, son of (?) Durham and Martha (? ), on 17 June 1925 at Morrilton, Arkansas. Hattie Juanita Crotchett died on 6 August 1985 at age 78. She was buried after 6 August 1985 at Plumerville Cemetery, Plumerville, Conway, Arkansas. Hattie Juanita Crotchett obtained US Social Security Card at Arkansas; last residence Morrilton, Conway, Arkansas. [S250] U.S. Federal Census 1930 U.S. Federal Census, by Ancestry.com, ED15-9. Dwelling. 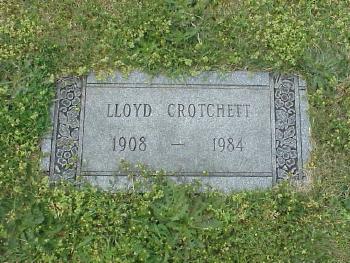 Lloyd Crotchett was born at El Dorado, Butler, Arkansas, on 10 August 1908. Lloyd Crotchett married Mildred Irene Tamm on 1 May 1930 at Philadelphia, Pennsylvania. Lloyd Crotchett married Dorothy Marie Maynor on 2 November 1946. 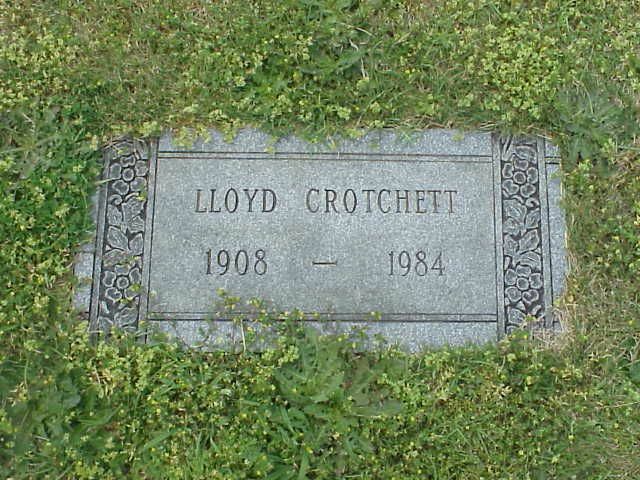 Lloyd Crotchett was buried in December 1984 at Edgewood Memorial Park, North Little Rock, Pulaski, Arkansas. He died in December 1984 at Little Rock, Pulaski, Arkansas, at age 76. Lloyd Crotchett had zero children. He obtained US Social Security Card at Pennsylvania; Last residence Little Rock, Pulaski, Arkansas..
Name Variation Martha I. McFarlin was also known as Martha Jane McFarlan. Married Name 16 February 1854 As of 16 February 1854,her married name was Tanner. Martha I. McFarlin was born circa 1832 at Illinois. Martha I. McFarlin died in 1876. He was the son of John Thurtell and Mary Brookes. Edward Brookes Thurtell died on 16 May 1876 at Sinipee, Grant County, Wisconsin (Vaughan Home), at age 60. He was buried after 16 May 1876 at Jamestown Cemetery, Grant, Wisconsin. Edward Brookes Thurtell Information about Edward Brookes Thurtell and his relationship to the rest of the family was provided by Charlotte Angst Mackie in 1997. He was omitted from the family tree done by Harriet Thurtell about 1900, probably in error. A diary done of her 1853 trip to America by his aunt, Anne Everitt, shows that Edward Brookes Thurtell had visited Guelph, Ontario, Canada, at the time of her visit there, staying with his uncle, Benjamin Thurtell, and his family during the visit. The records of Charlotte Mackie show that Edward Brookes Thurtell was the son of John Thurtell and Mary Brookes. He may have come to America with his uncle, Benjamin Thurtell, and Benjamin's children, in about 1835, helping Benjamin clear land and build a log house, before moving to Wisconsin. He married Amy Burns of Indiana in 1841, and they had nine children. The 1998 LDS British Isles Vital Records Index CD shows that Edward Brookes Thurtell, the son of John Thurtell and Mary, was born in Pakefield and christened October 10, 1815, as recorded in the Bishop's Transcript for Suffolk County, England (source: FHL Number 952322). A family history received from Robert Johnson shows Edward Thurtell and Amy Burns were married about November 1, 1837, in the Vaughan Home in Sinipee, Grant County, Wisconsin. The Grant County, Wisconsin, marriage index book shows Edward Thurtle married Emma Burns on November 19, 1841, at Simessee in Grant County. They were married by A. P. Renton, and the marriage was filed in Grant County December 10, 1841. The index does not show a volume or page number. Family tradition tells of a terrible storm while Edward Thurtell and a party of immigrants were attempting to cross Lake Michigan by boat.Those with Edward landed successfully, but others did not. There is an unverified statement that two of his brothers or other relatives were in another boat that turned back, according to information received in 1997 from Peter Murray. Although he is not in the index, he is listed in the 1840 U.S. Census for the Eastern Division, Grant County, Wisconsin, at the top of page 25, as Edward Thurtell, with the only person in his household (himself) a male age 20 - under 30. His friend, Peyton Vaughn, and his family are on page 24 of this census. He is listed as Edward B. Thurtell in the index to the 1842 Wisconsin State Census. This index shows him as living in the Western Division of Grant County, Wisconsin, and that the record is on Page 009, ID number WI43512. The census record shows him as the head of the family composed of three white males and two white females. Conrad Burns is listed in the internet index for this census as also being in the Western Division of Grant County, Wisconsin. He was not located in the microfilm for the census at the National Archives in Chicago, Illinois, on November 4, 1999. Some of the pages of this census are nearly illegible in the microfilm copy at this location, however. 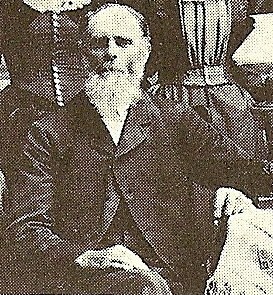 Edward B. Thurtle is listed in the U.S. Census Index for Wisconsin for 1850 and in the Wisconsin State Census Index for 1854. These show him as living in Jamestown, Grant County, Wisconsin, both years. The reference for 1850 is WI 136, and for 1854 it is WI. The 1850 U.S. Census for Jamestown, Grant County, Wisconsin, shows him as Edward B. Thurtle, age 35, a farmer born in England whose real estate wasvalued at $1200. His wife is shown as Anna Thurtle, age 28, born inIndiana. 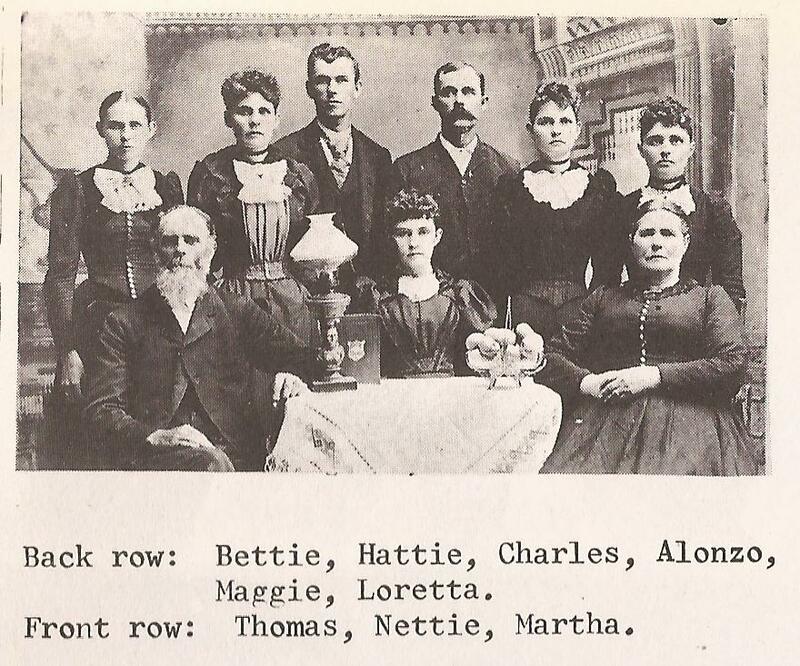 Their children, all born in Wisconsin, are shown as Edward, age7, Ann, age 6, Walter, age 4, and Catharine, age 1. There is a copy of a letter in the possession of Susan Persia Thurtell Miller written to E. B. Thurtell, Jamestown, Grant County, Wisconsin Territory, from B. Thurtell (obviously Benjamin Thurtell). The envelope was postmarked February 28, 1847, in Guelph, and the letter is dated March 1, 1847. The letter mentions not having heard from Edward in three years. The 1901 Grant County, Wisconsin, Biographical Sketch Book listing for Ransom B. Folts shows that Edward B. and Amy (Burns) Thurtell were 'old pioneers of Grant county. Mr. Thurtell was born in England, and his wife in North Carolina in 1820. They settled on a farm one mile north of Louisburg, where they lived until his death, in 1876. Mrs. Thurtell still survives, at the age of 80. There were nine children in their family.' Records of Jamestown Cemetery, Grant County, Wisconsin, show Edward Brookes Thurtell was born September 17, 1815, in Bakefield, Suffolk, England, and died April 16, 1876. The actual place of birth was probably Pakefield. An infant daughter of Edward Brookes and Amy Thurtell, who was born September 29, 1865, and died April 11, 1866, is also buried in this cemetery. The 1860 U.S. Census for Jamestown, Grant County, Wisconsin, enumerated July 14, 1860, on page 95 lists Edward B. Thurtle and his family. It shows the Post Office was Fair Play, Wisconsin. Edward B. Thurtle is shown as age 44, a farmer born in England whose real estate is valued at $3500 and personal property is valued at $900. Living with him is Amy Thurtle, age 39, born in Indiana, and eight children, all of whom wereborn in Wisconsin. Edward is 17 and a farmer. Ann, age 15, Walter, age13, Mary, age 11, Frank, age 9, and Frederick, age 6, are all shown as in school. The two youngest children are Harriet, age 3, and a not named daughter, age 1. The 1870 U.S. Census for the Town of Jamestown, Grant County, Wisconsin, enumerated August 6, 1870, showing the Post Office as Platteville, GrantCounty, Wisconsin, lists Edward Thurtle and his family on page 15, lines 9-15. He is shown as Edward Thurtle, age 54, a farmer whose real estate is worth $7000 and personal property is worth $1200. He is shown as born in England, with both parents of foreign birth. His wife is shown as Anna Thurtle, age 49, born in Indiana, whose occupation is keeping house. All five of the children listed show they were born in Wisconsin. Frank, 18, works on the farm. Fred, whose age is shown as13, also works on the farm and attended school in the past year. Harriet E. Thurtle, age 13, and Grace Thurtle, age 11, are shown as at home and attending school in the past year. Anna B. Thurtle, age 9, is also shown as attending school. On the same page of the 1870 census on line 16 is Walter Thurtle, age 25,born in Wisconsin, who works on the farm. Also on the same page on lines 17-18 are Ann Folts, age 56, born in Wisconsin, whose occupation is keeping house, and Edward R. Folts, age 1, born in Wisconsin. 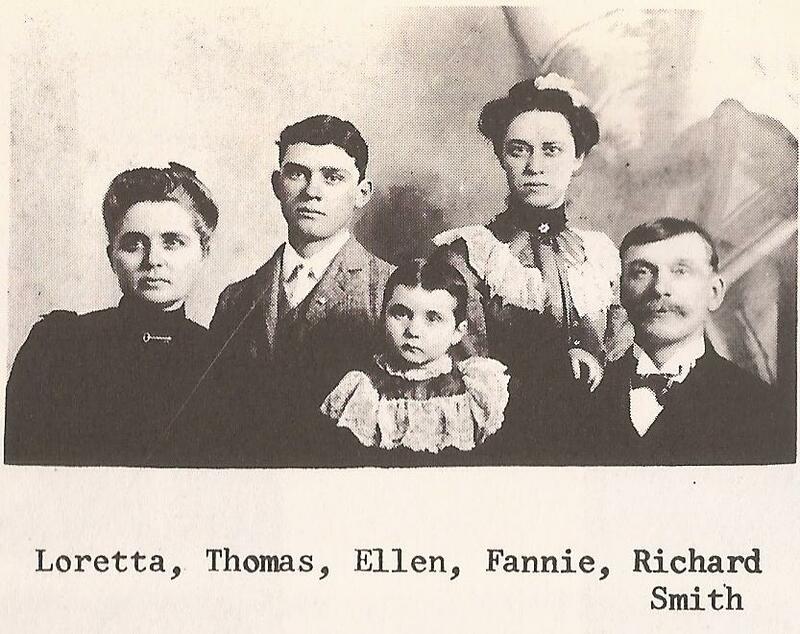 On lines 19-21 are Ransom Folts, age 27, born in New York, who works on a farm; Ann Folts, age 25, born in Wisconsin, whose occupation is keeping house; and Ransom Foltz, age 2/12, who was born in March 1870 in Wisconsin. He emigrated, circa 1835. Point of origin: England. [S98] Census Bureau, 1850 U.S. Census, Jamestown, Grant County, WI, page 136, ennumerated 9/19/1850, shows Edward. [S169] Wisconsin, The earliest volume of the Grant County, WI, marriage index shows Edward Thurtle was married does not show the volume or page number. [S249] U.S. Federal Census 1850 U.S. Federal Census, by Ancestry.com, Dwelling 717. [S248] U.S. Federal Census 1860 U.S. Federal Census, by Ancestry.com, Page 95. Dwelling 684. [S247] U.S. Federal Census 1870 U.S. Federal Census, by Ancestry.com, Dwelling 102. Name Variation Amy Burns was also known as Anna. Name Variation Amy Burns was also known as Emma. Married Name 19 November 1841 As of 19 November 1841,her married name was Thurtell. Amy Burns was born at Indiana on 11 August 1820. She was the daughter of Conrad Burns II and Sarah Chester. 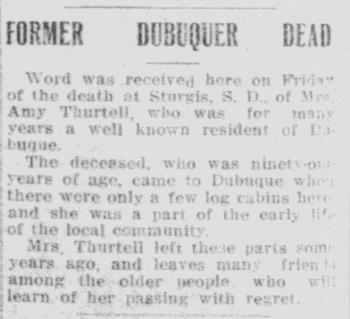 Amy Burns died on 27 October 1911 at Sturgis, Meade, South Dakota, at age 91 Mrs Amy (Burns) Thurtell obituary. [S246] U.S. Federal Census 1880 U.S. Federal Census, by Ancestry.com, Page 3. ED110. Dwelling 21. [S245] U.S. Federal Census 1900 U.S. Federal Census, by Ancestry.com, Volume 11, ED 34, Sheet 1, Line 56, dwelling 13. [S244] U.S. Federal Census 1910 U.S. Federal Census, by Ancestry.com, ED68. Dwelling 300. Stamp 53.